The folks at Skoda, the Czech VW subsidiary, have always had a stellar time reworking and elongating the Passat platform to make an upper-mid-level platform for that Czech executive on the go. Now we've got photos of the next generation Skoda Superb and, hey, it's better than ordinary. In fact, propelled by VW's 1.8 TSI it's downright pretty good. It'll officially bow at the Geneva Auto Show, an event we hear is good even relative to things otherwise considered good. Press release below the jump. With 4,838 mm in length, 1,783 mm in width, 1,461 mm in height and a 2,761mm-long wheel base, the new Škoda Superb offers a number of smart technological solutions, including adaptive "look-round-corner" headlamps, a new electronic air conditioning system, an automatic parking assistant system, and more. 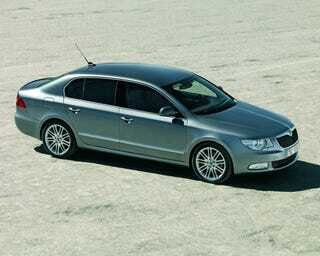 As safety was one of the top priorities in developing the new vehicle, the new Superb has altogether nine airbags. The new Škoda Superb will be available with three petrol and three diesel engines (77 - 191 kW) and with both manual and automatic transmission systems.